My iPhone has been saying: “There is not enough available storage to take a photo. You can manage your storage space in Settings. ” How do I solve this problem? I don’t want to delete my beloved photos to free up space, all of them are my best memories!- Jenna asked. I think most iPhone users have encountered this problem. When increasingly pictures are stored on your phone, the phone will run out of memory. To fix this problem, you have to delete some favorite photos to free up space. In fact, this is not necessary! Here’s a better way to not only keep photos but also clean up memory, that’s to transfer photos from your iPhone to the computer. Furthermore, backup iPhone photos to computer so that you won’t lose any precious photos, and you will find that it could save the day if disaster strikes. Now with the two tricks below, you can delete tons of photos from your iPhone without hesitation and enjoy taking new photos. Read on and find out how to backup and transfer photos from iPhone to PC easily. Gihosoft Mobile Transfer is a powerful and easy-to-use data transfer software that can be used not only for data transfer between Android and iOS devices, but also for data transfer between Android or iOS devices and computers. With it, you can easily transfer contacts, messages, call logs, photos, music, videos and calendar between Android, iOS, and PC or Mac. What’s more, the software supports almost all types of Android and iOS devices, as a result, you don’t need to fear about compatibility issues. Next, let’s see how to transfer photos from iPhone to computer via this mobile transfer software. Download and install the latest version of iTunes on the computer (for connection). Download and install the latest version of Gihosoft Mobile Transfer on the computer. Run Gihosoft Mobile Transfer software on your computer. Tap “Backup Your Phone” on the main interface of the program. Connect iPhone to the computer and tap “Trust” on the screen. Select “Photos” and tap “Start Copy”, then wait until completed. Tips: During the process of transferring data, please ensure that the phone is continually connected to the computer. When finished, you can preview all of the photos from the backup folder directly. Besides, if you need to restore them to your phone, the steps are also very simple: Run the software on your PC or Mac > tap “Restore Data from Phone Transfer”> connect your iPhone to the computer > once connected, select backup source and files > tap “Start Copy” to restore photos to iPhone. 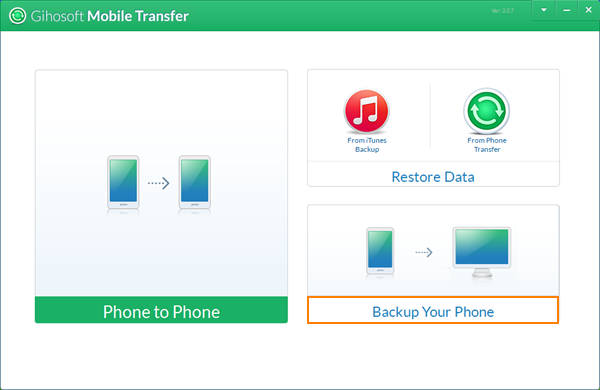 Apart from transferring pictures from iPhone to PC/Mac, this mobile transfer software can also be used for data transfer between other combinations of supported devices which includes Android to Android, Android to iPhone, iPhone to Android, iPhone to iPhone, iTunes to Android, iTunes to iPhone, etc. 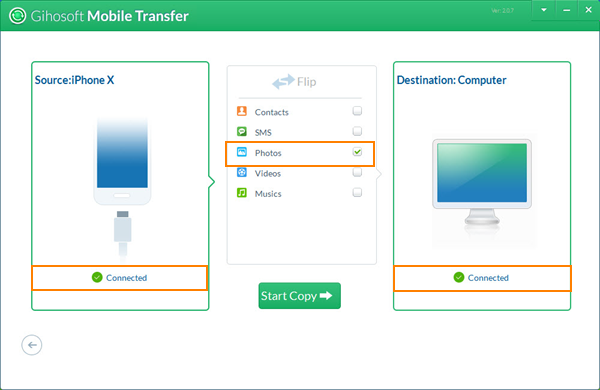 If you’d like to transfer photos from iPhone to iPhone, iPad or other devices, this program can also serve your needs. Another way to import photos from your iPhone to PC is using iTunes backup, which not only lets you organize and enjoy music, movies, and TV shows on your iPhone, but also helps you back up important data to your computer. 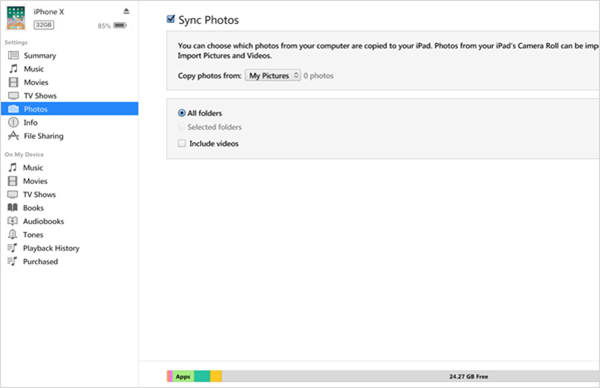 Read through the following steps to learn how to backup iPhone Photos with iTunes. Open iTunes and connect your iPhone to the computer. Tap “Trust” this computer on your phone screen. Click the small iPhone icon when it appears in iTunes. Select “Photos” in the “Summary” Section. Check “Sync Photos” and choose folder, then tap “Apply”. Note: Make sure iCloud is turned off on your iPhone or iPad. You can not create backups using iTunes when iCloud is enabled.